No, this is not me greeting a nudist parade. 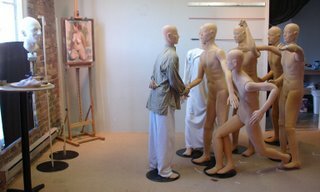 These are the my life-sized dummies that I use for painting models. This is the next stage of the “Joseph Greeting the Mob” painting, after transferring my concept sketch to canvas (see The Early Process, Sept 06) . I set these guys up to get a sense of scale and perspective and to work out thing like head and eye direction and model relationships. This makes it possible to work with one model at a time as I paint. As long as each model stays consistent with their corresponding dummy, things tend to go smoothly. Much of the painting I will do from photos I’ve taken of one model at a time. Then I will dress the dummies and work from life to get more info. I will also do studies from life and or use live models for the final touches. Joseph Smiths head will be done entirely from the sculpture at the left of the photo (see Before the Paint, Sept 06). Where do you get your mannequins?